I'm not what you'd call meatball snob. I'll eat most any meatball served. And most meatballs I've had are not bad. Some have been bad, really bad, but most are decent. Only three, however, have stood out as top tier meatballs. One, obviously, is my mom's. Another is my friend's family recipe. She won't share it. It's locked down and buried deep. So I there's no hope of letting you in on that one! The other one is a meatball my high school field hockey coach's mom made. I had it and thought to myself, these are the same as my mom's! They were an instant winner. My mom's meatballs are pretty basic. That's one thing I've learned, though. Your recipes don't need a thousand ingredients to taste good. Just a few quality ingredients mixed in the right proportions will land you a winner most times. With all that said, here's the recipe! Mix all ingredients together, adding enough breadcrumbs to make the mixture firm but not dry. Start with a cup and go up as needed to get the consistency described. Form into balls, the size of your choosing. Broil a few minutes, just until browned. * This is to drain fat, not fully cook the meatball. Place browned meatballs in red sauce and simmer about 1 hour. 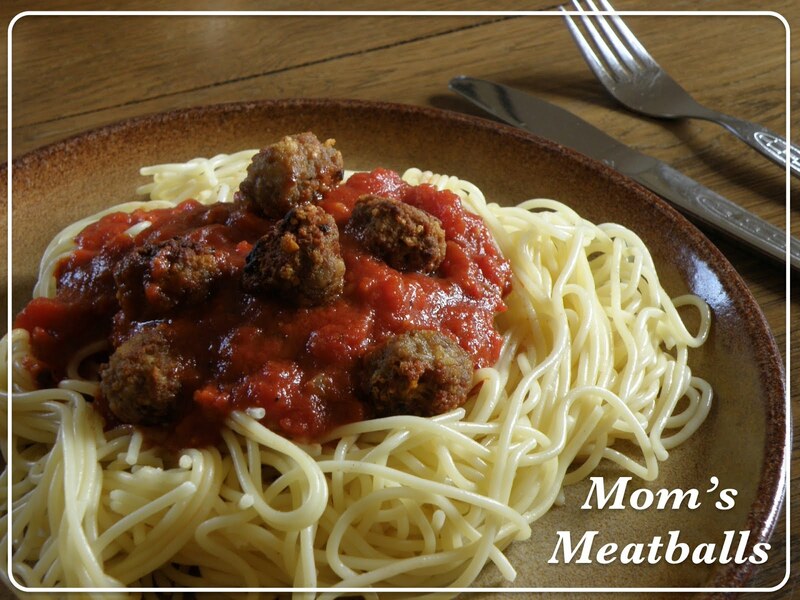 Meatballs can also be browned in the microwave starting at 3 minutes, then checking for doneness. Once again, this is to drain fat, not fully cook the meat. The slow cooker can be used to finish your meatballs in sauce, but I don't advise cooking them longer than 4-5 hours on low. Any longer than that and you'll end up with over-cooked meat that tastes more like canned fare than delicious cuisine. You don't want that! Thanks for stopping by. And as a reminder I'm participating in the Ultimate Blog Challenge. These are like how I make my meatballs. However, I never measure :-) One other slight difference is that I will use grated cheese instead of the Parmesan Cheese (assuming that it is ground up as in the kind you sprinkle onto pizza and such). You're welcome! It's the best way. The parmesan I use is just the stuff from a can, lol! These sound yummy and I can't wait to make them for my son as he loves loves loves Meatballs and I didn't have a clue how to make them for him. So easy. I hope he loves them! I married into an Italian family and meatball recipes have been the focus of many discussions - especially broil vs put into sauce raw. I am definitely in the broil camp. Happy to see you are, too. Yes, otherwise the sauce is too greasy! My friend who has the secret recipe is Italian. I swear she adds pork, but she says no. She says basil is the secret but won't give more details than that! I was getting excited until I saw the cheese. Another recipe that I can read about and not employ. As I'm reading your blog, my hubby is making meatballs with his secret recipe that he never shares! LOL Your's look delicious!